Every smart PR professional knows that PR dollars don’t just fall into your lap. It takes work to convince clients and executives that investing more money in PR will truly pay off. In order to earn additional resources for your program, you first need to show that you are successfully managing the resources you already have. Then you must prove that you could accomplish even better results with a larger PR budget. Making a solid case for funding requires referencing information that highlights PR’s achievements and points to its potential. As a bonus, we will also discuss how you can recover from having your PR budget cut. A brief summary of Wallop! OnDemand, a PR measurement tool, that is both customizable and affordable enough to fit any size PR budget. With both full service and DIY options Wallop! is a perfect fit for agencies and corporations alike. When clients ask questions about the performance of a public relations program the PR team generally responds in one of two ways: 1) they scramble and use valuable time set aside for campaign work to piece together the information the client is looking for, or 2) they confidently say “no problem, you’ll have it within the hour” and effortlessly deliver the info the client requested. The difference comes from keeping good records, measuring results, and having an organized reporting system in place – one that lets you pull up information in just a click. • Is PR getting results? • How do our PR results compare to the results of our competitors? • How can we improve the program? Then, we will discuss how not to answer these questions – and give you some easy suggestions for answering tough client questions by incorporating data to prove PR results. •Exactly what you stand to lose if you don’t deliver the level of PR evaluation your clients and executives require. •What failing to measure PR could cost your agency, or your program, in actual dollars. 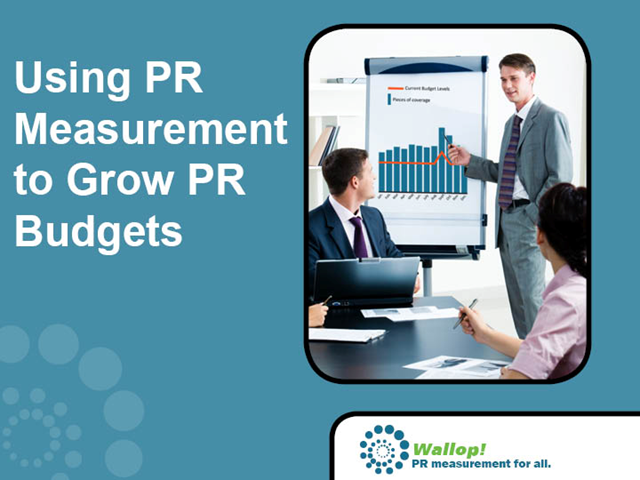 •How PR measurement can improve an agency’s bottom line – or for corporate PR professionals – how it can help you lobby for more resources and budget dollars. The C-suite is facing growing pressures from the marketplace, boards, shareholders and their colleagues to deliver more, faster and better than the quarter before. To hold their own among this always-cynical group, PR professionals must speak their language and demonstrate how PR is helping them achieve strategic business goals in markets around the world. When executives ask about the performance of the PR program, they want clear-cut answers and that means success metrics, numbers, graphs, charts and ROI. They want more, faster and better than the quarter before. And remember, the better you package the results of your program, the farther you will go in your career. The boardroom cares.